“If music be the food of love, play on!” This famous Shakespearean quote, according to the Phrase Meaning website, refers to Orsini requesting an excess of music to sate his obsession with love, much in the way food satisfies one’s appetite. On Valentine’s Day, my husband and I bathe in excessive amounts of both food and music. Nothing thrills us more than a beautifully orchestrated meal set to Zimerman’s romantic interpretation of Chopin’s 4 ballades, played repeatedly. 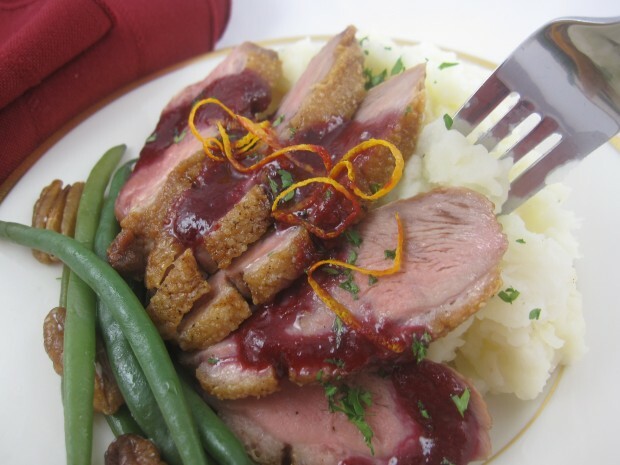 Duck breasts are one of our favorite dishes, easy to prepare and perfect for a romantic evening spent at home. I wish duck, like chicken, were more readily available in America. I adore it’s rich, dark meat, especially when served medium rare and paired with fruity sauces. I’m speculating many Americans are put off by the fat rendered from cooking duck. I drain and save the fat, coveting it as an added bonus. The Science of Cooking website, among others, touts duck fat as a healthy substitute for butter. I, personally, love the savory, rich “mouth-feel” of many foods cooked in duck fat. In this recipe, the sauce is made while the duck is cooking. You may, however, find it easier to make your sauce the day before serving. Raspberry sauce may be made up to 48 hours in advance; simply reheat before serving. I always serve duck breasts with mashed potatoes and turnips; a heavenly marriage of flavor and texture! With a sharp knife, score (slice) duck skin in a crisscross pattern, completely penetrating the skin without cutting too much into the flesh. Lightly season duck with kosher salt and freshly ground pepper. Place duck breasts, skin side down, in a cold sauté pan large enough to accommodate them. 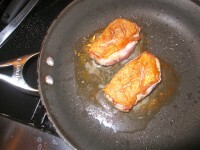 Adjust heat to medium and let ducks cook 15-20 minutes, without shaking pan, or until skin is golden and crispy*. Turn breasts over and cook an additional 5-10 minutes for medium rare (130 degrees), depending on the thickness of the breast; an additional 5-10 minutes for medium. While duck is cooking, melt butter over low heat in another large sauté pan. Add shallot and pepper and a pinch of kosher salt and sauté until softened, about 3 minutes. Deglaze pan with Grand Marnier, if using, then stir in raspberries and sugar. Simmer raspberries, occasionally stirring, 10-15 minutes or until raspberries are completely broken down. Place mixture in a fine mesh sieve over another bowl. With a rubber spatula, press raspberries into sieve until all liquid is extracted. Let duck breasts sit 5 minutes at room temperature. Carve with slices cut diagonally on the bias, leaving the end intact. Fan breast to shingle on plate and serve with raspberry sauce drizzled over the top. Garnish with zest and parsley, if using. *Note that crispy skin is ideal for perfect duck breasts. If the flesh is cooked to your liking but the skin is not golden brown, turn the heat to high and sear the skin further. I’ve also seen chefs use a culinary torch to crisp skin; I did not find this necessary with this recipe. I have to say that Im really unepiressmd with this. I mean, sure, youve got some very interesting points. But this blog is just really lacking in something. Maybe its content, maybe its just the design. I dont know. But its almost like you wrote this because everybodys doing it. No passion at all.